Is this a light that you want to stay on when there’s motion or you want the fixed 60 seconds turn off as soon as the motion is detected? The motion going inactive is canceling the task which is why it’s not turning off. This ends up being two triggers in the same piston, but the 60 seconds countdown restarts each time it sees motion. Alternatively, if you want it turning off after 60 seconds even if there is still motion detected, then you can use your original piston. Just select the “With” block and set “Task Cancellation Policy” to Never. My circumstance s actually more complex. But I wanted to get this building block in-place before building further. A. If the light has been operated by anything other than this piston, this piston does not interfere with it. B. If the light has been turned on by this piston’s motion sensing, it stays on for 7 minutes and then turns off. 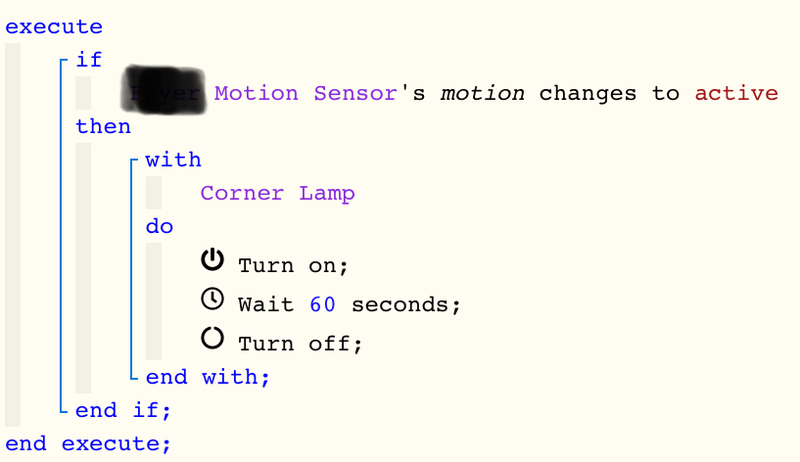 C. If motion is sensed once during that timeframe, the countdown to turn-off does not change. D. If motion is sensed twice during that timeframe, the light stays on - and it starts the countdown again. 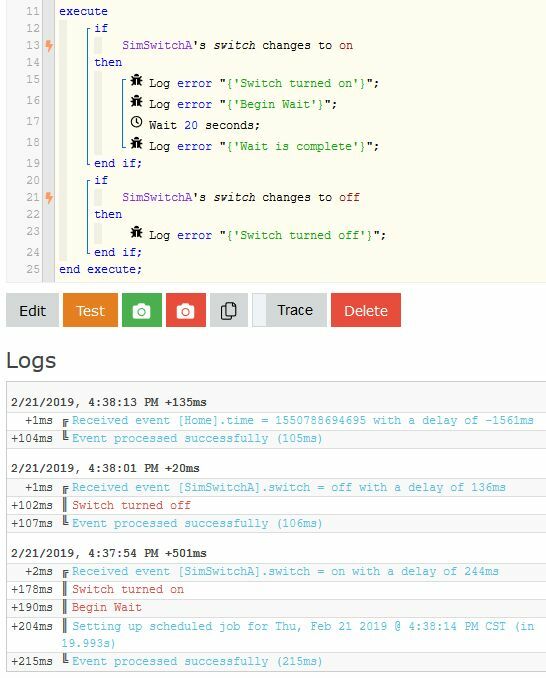 I guess I’m surprised that, since never in the piston do I specify anything about motion turning inactive, the sensor going inactive would turn off the scheduled action. If you look at the Task Cancellation Policy of the task, that is the default WebCoRE action. If you want it not to cancel then you’ll have to override it. never in the piston do I specify anything about motion turning inactive, (so why would) the sensor going inactive would turn off the scheduled action. If the conditions that initiated a block of code changes, then that block is no longer true, so by default, it will stop running that block. Setting TCP to Never can override this default behavior. Not to nitpick… but then why does the 60-second countdown continue? If the block ceases to run when the condition that triggered it changes, then the countdown should also cease? I get that this is how it was configured. I just can easily see (as in this instance) where you’d want a trigger to set a chain of events in motion, AND have it run even though the trigger condition changes, AND still have instances where you’d want the task to cancel. why does the 60-second countdown continue? If the block ceases to run when the condition that triggered it changes, then the countdown should also cease? The way schedules works is the countdown you see is created at the beginning of the 60 seconds… (the piston is not running during that Waiting period) All it knows is that is should wake up in 60 seconds and continue. If the status changes during the wait, the piston will not be aware of that until the timer has expired. (or another trigger in the same piston fires) It is at that point that the piston sees that the trigger is no longer true, so it will not complete that block of code. I just can easily see (as in this instance) where you’d want a trigger to set a chain of events in motion, AND have it run even though the trigger condition changes, AND still have instances where you’d want the task to cancel. My educated guess would be that you likely have too many triggers in your piston. I generally limit my pistons to a single trigger, or at most two if they are the opposites of each other. Remember, each and every trigger runs thru the code from top to bottom, so the more triggers (lightning bolts) you have in a piston, the more likely there will be an overlap in logic. I can get much more complex pistons with only a single trigger in play. Which makes the answer a variable. It always seems to come back to that, doesn’t it. Etc. just thinking out loud, as it were. IF ( 7 ) in IF ( 1 ) > lamp stay on. IF ( 1 ) , IF ( 7 ) > lamp turn off when motion change to inactive, the wait no work ??? Line 7, 8 and 9 will never run unless you place them outside the IF, or follow my earlier suggestion and set “Task Cancellation Policy” to Never. the wait no work ??? @trandzung, here is the general practice for Waits with motion sensors. I then flipped the switch on, waited about 10 seconds, and flipped it off. When it came back from the wait, it didn’t notice that the switch was no longer on, and it did send message 2. Is there something different between switches and motion? Yes, when I use the " wait “, usually I go to " general practice " first. Depending on requirements, I set " Task Cancellation Policy” as a Default or Never. But I still don’t understand , what is the role of " variable1 " on this logic ? what is the role of " variable1 " on this logic ? Personally, I love variables, but they are not needed at all for motion sensors unless you are doing some funky coding, or trying to squeeze in a bunch of triggers into a piston for some reason. Does anybody have a good example that shows this behavior? Here is a basic piston showing you how a change to the trigger can stop events after the Wait. In this test, I manually turned on the switch at 4:37:54, and then turned it off 7 seconds later. OK, that makes sense. Without TCP set, I would assume that a new trigger event would kill the code after the wait. If you didn’t have that second if block, and ran the same test, you’d get the “complete” message. The whole piston isn’t re-run after the wait, just the remaining code…right? The whole piston isn’t re-run after the wait, just the remaining code…right?